The Yellow Vest movement was triggered by the announcement of higher fuel prices, both now and in future years. It does, however, reflect a much deeper anger, with many more serious causes. A simple rise in fuel prices would certainly not have caused such anger if it were not added to a situation of major global economic crisis, increasing misery and increasing unemployment which is reflected here in France in further increases and pressure on the working class to pay for it. To this we must also add the cuts in all welfare benefits. This social movement began with the first national demonstration of 17 November 2018. It is heterogeneous but runs deep; and even today it is still difficult to predict how it will evolve. It can only be said that since it has lasted over a fortnight, it is developing and that it poses many questions such as the rejection of all the political parties and unions with an expressed will to trust only the demonstrators. The objective of our text is not to make a hasty analysis of the events, which will proceed according to their own logic, but to encourage reflection on the context in which this movement emerges right now, in France, and on the balance of forces that would have to be in place to make a real break with the class collaboration that characterises social and political life. For the first time, despite the pressures and manoeuvres of the government to discredit it, this movement is supported by the vast majority of the population. Over 80%, according to polls. For example, increases in feudal taxes led to a series of peasant uprisings, under the leadership of a new class born from the market: free farmers who, from simple peasants, had managed to become landowners, sufficiently educated to organise and lead a national peasant revolt. But because of the dispersed nature of agricultural production and the necessity of interrupting the revolt during the harvest, these revolts were halted by the nobility. This was the case of the Jacquerie in France in 1358 and the revolt of Wat Tyler in England in 1381. While it is clear that the Jacqueries didn’t last long and could not solve anything, the fact remains that they announced the advent of a new world. They posed a question even if it could not be solved at that level. So we could leave it there and shout: "Move on, there is nothing to see” in this movement of the Yellow Vests, and then recite our Marxist catechism while waiting for the pure struggle of the workers to respond to today's social impasse. What lessons can we draw for the workers’ struggle from this movement? We know that in history, no movement appeared chemically pure with a real awareness of what it represented. Thus the Paris Commune started with nationalist demands for carrying on the war. The Russian revolution was part of a women's revolt that demanded bread. It was the same for the French Revolution, which had nothing of a proletarian purpose before becoming a bourgeois revolution. One remembers the alleged ridiculous comment of Marie Antoinette; "If they have no bread, let them eat cake!". Cromwell's British bourgeois revolution started around the question of religion before it became much more significant as it too had inter-classist components. • The need to fight and oppose new attacks on workers. • The attempt to stop the generalised offensive of the bourgeoisie with its austerity measures that have gone on since the 1980s and, in this sense, it is one of the first major attempts to take the initiative on the streets against the steamroller of the conquering bourgeoisie. • The existence of an extraordinary hatred and a storm of protest against all political, economic and media powers that have imposed this false democracy upon us. • A challenge to the political manoeuvres of the various hidden components of the ruling class system of management. The Yellow Vests, having no confidence in the government, filmed what was said behind the closed gilded doors of the ministries. The Prime Minister's refusal of another filmed meeting ended the next (Friday, November 30). And similarly Yellow Vests refuse to appoint delegates because they are calling for a true participatory democracy from the ground up. • On the other hand, the whole of the bourgeoisie and its establishment made no mistake. From the beginning all their political parties (both right and left) their unions and their confused media have stood against this movement describing it first as an extreme right movement then manipulated by the extreme left before trying to discredit them all as a pack of thugs who offer no solution since they have such varied and contradictory demands. After 3 weeks of struggle, all the leftist parties and the unions are now running behind the movement especially in trying to drown it by supporting struggles in sectors that they know how to handle like high school pupils.... They are trying to put forward a "social Grenelle" as the CGT and Gaullist government did in 1968. "We need a COP  for the territories. Ecological transition must be combined with social justice" (Laurent Berger general secretary of the CFDT trade union federation) on France 2, November 26, 2018. By its very duration, the movement is a challenge but now it is beginning to involve white collar workers and other social categories in the fight as in some hospitals, post offices, unemployment exchanges or the Lyon metro, not to mention some high schools and movements in some universities, etc. What is the bourgeoisie doing? The biggest danger for this movement is that it ends up reviving a social democracy that could present itself as a left alternative to the austerity promised by the rest of the political class, without ever calling into question the foundations on which capitalist society is built. By social democracy we mean the movement that goes from the Socialist Party and its multiple chapels, the leftists (LO/NPA ) through the Stalinists (PCF) and the left party (followers of Mélenchon and the like) as well as various Greens. They can make use of their social function to offer advice and offers of discussions to Macron and his government, especially the CFDT (see above). What first lessons can we learn from this movement and the mobilisations that will certainly go on and continue in other forms? 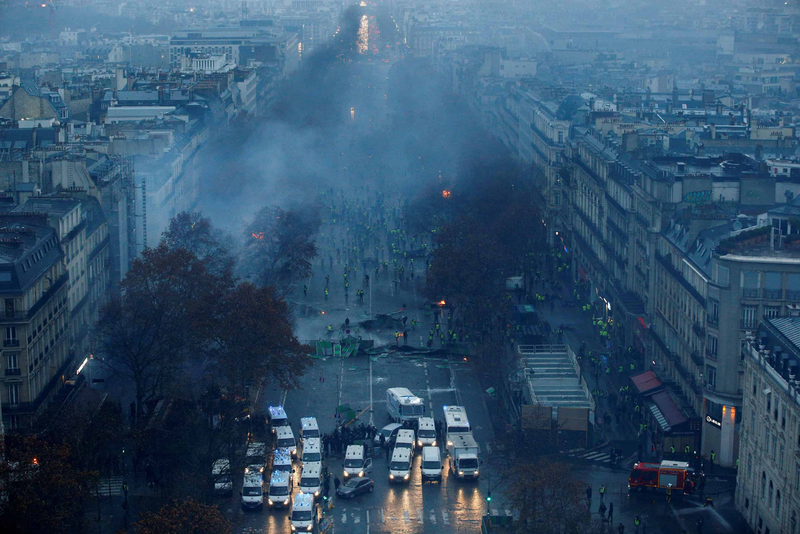 • The return of massive social struggles against austerity (which had not been seen since 2010 in France) and an interruption of the 'gloomy' atmosphere after the repeated failures of recent struggles and mobilisations. No-one’s talking about terrorism anymore! • The development everywhere of 'discussions', and concerns that go far beyond the single issue of the petrol tax and taxation, to the prospects for the emergence of another society. Some are even talking about a new May '68. Of course, this movement may be a platypus but it allows for a collective search for ways to fight (assemblies, elected delegates revocable at any time, rejection of parliamentary democracy) and actions that are absolutely necessary for any perspective of struggle and its extension. This movement has now spread to Belgium and the Netherlands. It is therefore the global system that is in question and not just one state! • Now, given the cul-de-sac in which the Yellow Vests movement is in, it is only the struggle of the working class that can really offer a solution for the whole of humanity and the impasse of the current capitalist world and of its generalised economic crisis. And yes! The only real prospect is for the working class to organise in workers' committees and strike committees elected and revocable at any time, that the workers assemble in their workplaces, discuss and decide their demands and their programme of action. Without this new phase, the movement of the Yellow Vests, like all other Jacqueries in history, will not last long. The Yellow Vests are a sign of the current weakness of the working class, which has not yet been able to express a real way forward for humanity in the face of the impasse of capitalism. • And to lead this huge task of transforming society, the working class needs to organise itself around it own internationalist, communist and revolutionary political party. "All historical movements have so far been carried out by minorities or for the benefit of minorities. The proletarian movement is the spontaneous movement of the immense majority for the benefit of the immense majority." (Manifesto of the Communist Party, Marx and Engels). Reminding us of the slogan “We are nothing, we must become everything”. The Grenelle Agreement was agreed in May 1968 between De Gaulle and the Stalinist-dominated CGT union confederation to end the strikes. It raised the minimum wage by 35% and all wages by 10% but was rejected by the workers who carried on striking until De Gaulle won a new election. Lutte Ouvriere (Workers’ Struggle) and the New Anti-Capitalist Party are the main French Trotskyist organisations.